For people like me that do a lot of curation via Twitter, this is a real workflow advantage. Instead of finding and tweeting interesting content several times daily, I can scan dozens of blogs and email newsletter and RSS feeds in one sitting in the morning, and then use the Buffer browser app to set up tweets throughout the day. Doing so allows me to focus my other Twitter interactions on engagement and response, rather than curation. I’ve used Buffer off and on for a while now (and I REALLY want Buffer to get together with my guys at Argyle Social, which I use most often for social media marketing due to their extraordinary statistical capabilities). When I’ve used Buffer consistently, I’ve seen my clicks and retweets increase, and new research of 2,000 users finds that effect isn’t isolated. Buffer’s data shows that within 2 weeks of starting to use the system, users’ clicks increase by 200%, and retweets by 100%. There are two seemingly plausible hypotheses for this impact (but a fully controlled study has not been conducted to isolate or confirm, so please take all of this with a degree of skepticism). After signing up for Buffer ($0 – $30 per month), users send 150% more tweets than they did before using the application. More tweets will almost always yield more response because unless you are very new to Twitter or particularly maladroit at it’s norms and customs, every tweet you send should generate some response. This makes me feel good about the Buffer stat of 200% more clicks, but less happy about the 100% more retweets. If you’re sending 150% more tweets, shouldn’t your retweets go up by at least 150%? If not, then it would appear that the likelihood of a retweet on any given tweet actually goes down after signing on to Buffer. This actually makes some intuitive sense, however, because if you start tweeting substantially more, your followers won’t necessarily want to retweet you multiple times daily to keep pace – it looks too stalkerish. Except when live tweeting an event, I don’t think I’ve retweeted the same person twice in one day, ever. There is a lot of research around the “optimal” time to tweet, but these types of broad generalizations are difficult and somewhat dangerous, as they typically do not adjust for time zones and other circumstantial factors. The idea that there are universal “best” times to tweet reminds me a lot of the long-ago rule in email marketing that you didn’t want to send on Monday or Friday because many people were on vacation. So, everyone started to send T-Th, and the volume on those days spiked so high that response rates fell through the floor. So in response, the new best practice became to indeed send on Mondays or Fridays. Madness! Yes, you should pay attention to optimization research and social media science. But also recognize that slavish devotion to conventional wisdom 100% guarantees that you will never be extraordinary at anything. Average people worry about averages. 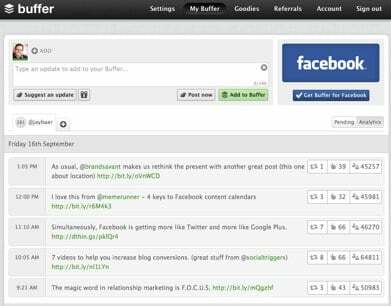 The fact remains, however, that Buffer automatically sets up your tweets to be sent when more people tend to be using Twitter, naturally increasing potential audience for many Buffer users. You can override the Buffer default settings (as I do) to Tweet more often, on a more diffuse pattern, to include nights and weekends, and/or to Tweet closer to the top and bottom of the hour. By the way, I’m working on a super cool Webinar with Argyle Social to reveal some very interesting, thorough research on social media timing. Join us for free on October 27. The other issue is that while clicks and retweets are psychically satisfying in the same way a perfectly cooked In-N-Out Burger hits the spot, that’s not really your goal is it? Remember, the objective is not to be good at Twitter, the objective is to be good at business because of Twitter. And that usually means some sort of conversion event, and data on that point isn’t available yet. Buffer saves me a ton of time. I recommend it constantly. I very much like their team personally (Leo Widrich is a one-man clinic on community management). And I like what it’s done for my Twitter results – and it appears the results of a bunch of other people. But let’s keep all of this in the proper perspective. Ultimately, it’s not about timing and volume and software. It’s about people, what you tweet, and how you treat.